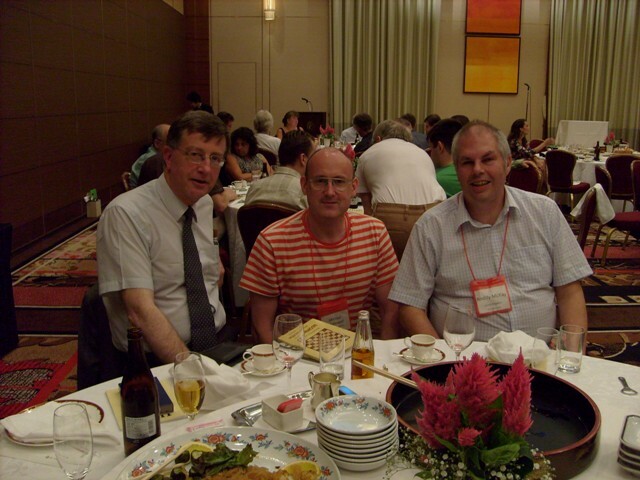 It is with great sadness that The British Chess Problem Society records the death of one of its most illustrious members, Chris Reeves. To attempt to write anything so soon after the passing of a man whose life has been so full and rich is not easy. Fuller tribute will be made later in the pages of our magazine. My few words now will paint an incomplete but personal picture. Chris’s early exposure to chess problems came through D. M. Davey’s column in The Tablet. He started solving the diagrams at the early age of 8 and he enjoyed the perceptive comments of the solvers as much as the problems themselves. With this essential background he tried his hand at composition when he was 21. In this he was encouraged by the “modern” #2 work being undertaken at the time by Barry Barnes, Michael Lipton and John Rice. Chris was never a prolific composer; in the 1960s he composed about 70 problems and has passed the century marker only in recent times. One reason for this was that he always set himself very difficult tasks; he once described worthwhile #2 composition as the “art of the almost impossible”. The technique, imagination and determination he showed in his work were quite extraordinary. The example below is a good illustration. 1.Sc~? (>2.d4) Bxe3! 1.Scd4!? (>2.Rxf5) hxg6! 1.K~? (>2.Rxf5) hxg6! 1.Ke7!? (>2.Qxd6) Rxc6! 1.Se~? (>2.Qxd6) Rxc6! 1.Sc5!? (>2.d4) Bxe3! Cyclic white threat correction achieved in style in 1970! The play is completed by two further corrections by the wSe6. Chris trained for the priesthood before making a professional switch to child psychotherapy and a personal switch to marriage and family life. He was a wonderful man and a friend to so many of us. He loved people and he enjoyed the interaction with them. Never was this more apparent than in his role as editor of the #2 column. He saw his role as one of trying to help a struggling contributor to find the setting with which his correspondent was content. When I returned to #2 composition I too was a beneficiary of this attention. His secret was the knack of asking the most searching questions; he would have made an excellent teacher. Instead he devoted himself to helping emotionally disturbed children. He was professionally active until the end; only a couple of months ago he returned from a demanding round of lectures and workshops in Brazil. Chris gave unstintingly to others; his was a life so very well lived. He will be missed by many and remembered with great affection. Our loss is as nothing to that of his wife, Claire, and their daughters. We offer them our heartfelt sympathy. 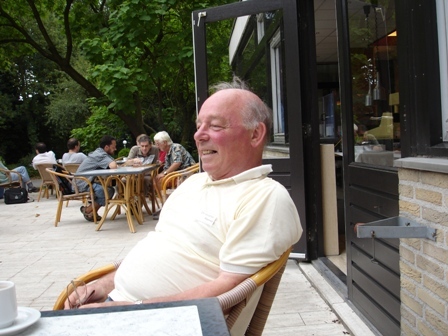 Chris Reeves at the PCCC meeting at Wageningen, The Netherlands, in 2006. American composer Dan Meinking died on 23rd November 2012, at the early age of 52. Dan was well-known to readers of The Problemist as a longtime contributor, especially in the field of helpmates. In 2009 he was awarded the title of FIDE Master of Chess Composition. According to a notice in the Cincinnati Enquirer he was an avid game designer and his Alpha Sleuth and Lexmaze puzzles were published in “Brain Games” games books. His death is a significant loss to the American problem community. Robert Tony Lewis passed away on 31st October 2012. 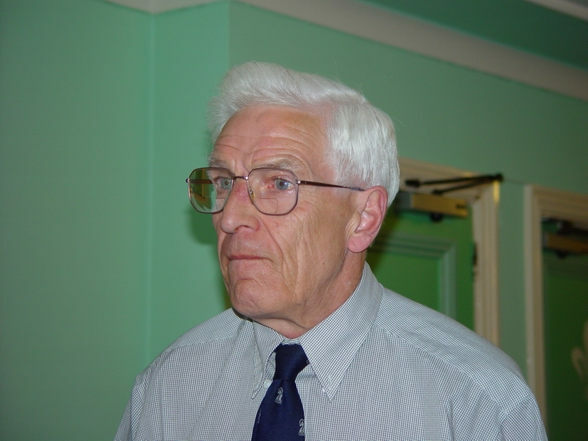 Born in Lancashire on 5th February 1933, he was introduced to problems at the age of 12 by Edward Boswell, who gave a talk on the subject to the Morecambe Grammar School Chess Club. His earliest problems appeared in ‘Chess’ in the late 1940s and he was a prizewinner in the first McWilliam tourney for composers aged under 21. Tony became fascinated by two-move block problems, an area in which his skill earned him the affectionate nickname “Mutateman”, though his formidable constructional ability also saw expression in other types. An excellent solver, Tony won the solving championship of The Problemist many times in the 1960s, 70s and 80s in partnership with Sally Lewis, solving as “T.Sal”, and also represented Great Britain in the World Chess Solving Championship of 1983 at Bat Yam. Tony was a stalwart of the BCPS for many years, serving as President from 1997 to 1999. He became Society Treasurer in 1995, a post he only relinquished in April this year, and his careful management is responsible for the sound financial position the BCPS finds itself in today. In the early 2000s he and Sally organised three consecutive BCPS weekends in Cheltenham, and both regularly assisted at the British Solving Final. Our commiserations go to Sally and the Lewis family. For examples of Tony’s work see The Problemist Supplement for November 2011. Tony at the 2002 BCPS meeting in Cheltenham. Photo: Franziska Iseli. From left to right, Ian Watson, FM Michael McDowell and Roddy McKay. 2012/10/04 – Great Britain's new Grandmaster! At the WCCC in Kobe Christopher Jones was awarded the FIDE Grandmaster of Composition title for reaching 70 FIDE Album points. Christopher is renowned in the problem world for his helpmates, which for around 25 years now have been baffling solvers, and he is a much sought after contributor of originals to international solving events. In addition he has conducted both the original helpmates and selected helpmates columns of The Problemist for many years, as well as serving as BCPS Secretary and lately Assistant Treasurer. A selection of his problems can be found in the Composers section of this website. Christopher is only the third British composer to have been awarded the GM title, following in the footsteps of Comins Mansfield and Norman Macleod. On behalf of the BCPS many congratulations! Our Italian friend Ivo Fasiori emails us to inform us that the veteran Italian chess composer Professor Oscar Bonivento died in the hospital in Bologna on 1st October. As well as his composing activities, Bonivento edited chess problem columns and produced many books about Italian chess composition and composers. No doubt a more informed obituary will appear in The Problemist in due course. In the meantime here is one of the Professor’s successes. The three defences 1...Sxc6, 1...Sf7 and 1...Rh7 lead to different mates in each of the three phases. This is the Zagoruyko Theme. The BCPS sends its condolences to Professor Bonivento’s family and friends and to all Italian Problemists. I am sad to announce that British chess solver/composer John Coward died suddenly towards the end of May following a fall on the pavement outside his house in Harrow. John was always a keen solver and was a regular competitor in the British Chess Solving Championship, qualifying for the final on many occasions. His best performances included fifth place in 1985-1986 and fourth places in 1987-1988 and 1990-1991. When, in 1992, the BCPS committee thrust upon me the responsibility of editing the planned Problemist Supplement (I had only offered to do the typesetting), John, as one of the many friends whom I had met through the hobby, was one of those I approached for help. I was delighted when he agreed to write a regular ‘Selections’ column for the new magazine, and he did so for two years between May 1992 and May 1994, introducing the readership to most of the basic terms and conventions of chess problems. John wasn’t a prolific composer by any means, so in 1992 I was particularly pleased to publish the following problem. It is of a type he was especially fond of and is a version of a problem he had first published in the Evening Standard in 1955 but had never been totally happy with. The solvers enjoyed it. The problem, the solution and the solvers’ comments are below. Dom Cyprian Stockford, a long time member of the BCPS, died at Downside Abbey on 6th July 2012, aged 90. He was a noted organist and mathematician, and had taught mathematics in the Abbey School for many years. He also ran the Downside School chess club, which competed in the Somerset league. An active solver and composer, his major interest was Fairy Chess. He composed a number of joint problems with the late Denys Bonner. The Final of the 2011-2012 British Chess Solving Championship, sponsored by Winton Capital Management, was held at Eton college on Saturday 18th February. A strong field included four guest solvers from abroad, three of them solving GMs. The event featured another impressive performance from five-times former World Champion Piotr Murdzia from Poland, who won the event without dropping a point. Runner-up was Belgium’s Eddy van Beers, fresh from his success in the International Solving Contest last month. In third place, just edged out on time, was Scottish o-t-b GM Colin McNab, who thereby claimed his first British Championship. Colin is only the sixth solver to win the British title since the event began 32 years ago. Britain’s former World Champions Jonathan Mestel and John Nunn placed 4th and 5th respectively. A notable performance was recorded by David Hodge, competing in his first event, who finished 11th, ahead of many-times British Champion David Friedgood. Top scores 1. P. Murdzia 65/65; 2. E. van Beers 61; 3.C.McNab 61, 4.J.Mestel 59; 5.J.Nunn 56. The full results and the problems used can be viewed here. The white knight sacrifices itself, while unpinning the black rook. Some were caught by the try 1.Nb1?, defeated by 1...e4! After each capture on g2 the knight exploits the fact that the capturing piece can no longer capture on d3. Geoff Foster, editor of The Problemist Supplement, has been awarded the Whyatt Medal by the Australian Chess Federation. See Peter Wong’s announcement on the OzProblems site, (stroll down to the ‘Walkabout’ blog) which also links to more information about Geoff. Well done, mate! John Beasley has produced a new collection of the endgame studies of Richard Réti. He presents the studies with full solutions and, in some cases, provides intriguing information about their composition. An altogether first class presentation and warmly recommended. It is available to read (and download) from the JSB Website. From the front page select ‘Orthodox Chess’ and then ‘Endgame Studies’. Besides the Réti material, there is much else to interest the chess composition enthusiast. The BCPS is disappointed to report that yesterday they were contacted by Mike Basman of the Delancey UK Schools Chess Challenge (the British Land UK Chess Challenge with a new sponsor), informing us that there were no funds this year for the event to include a Mightiest Of Minds Junior Chess Solving event.